Founded in 2013, Alternative Retail Products, t/a AR Brands is an innovative FMCG marketing and manufacturing company. Our Greenfields factory is based in the heart of the Kwa-Zulu Natal in the gracious Capital city of Pietermaritzburg, South Africa. AR Brands has room to expand as the company grows and is well situated to reach into Africa or Internationally due to our position on the multi-modal transport network, which links the hinterland with the International Durban Port and Dube Trade Port including the International King Shaka Airport. Taysti Mayonnaise is an Egg and Dairy Free Mayonnaise. It has a popular tangy taste with a creamy mouth feel, which perfectly complements any meals consumers might lovingly prepare. 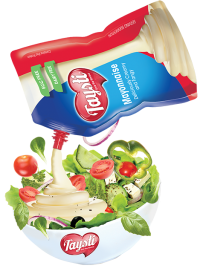 Recently AR Brands has created two new and delicious Taysti Mayonnaise variants for the consumers with most health and dietary requirements; Taysti Mayonnaise Sugar Free and Taysti Mayonnaise Lite Oil (also Sugar Free). Both variants are still Egg and Dairy free. Taysti Mayonnaise is packaged in an attractive Doye pouch, which is easy to use, hygienic, economical and environmentally friendly. It has an easy open and easy pour nozzle allowing consumers to use just the right amount of mayonnaise regardless of the occasion or dish. It’s safe and easy for young and old consumers to open. Consumers will love the two convenient pack sizes, the 375g, 700g. Taysti Mayonnaise has received the Kosher Parev, Halaal and Shuddha (Hindu) marks of approval because the product contains no dairy or egg. Our factory has also been certified FSSC 22000, which is the internationally accepted standard used to harmonize food safety management systems based on the HACCP principles.